For starters, what's left of your tree is going to be in the way which makes it hard to deal with during tasks like mowing the lawn. Not to mention, couldn't you better use that prime real estate for something more productive like a garden or another aspect of well planned landscaping? What may also come as a surprise is that, with the roots still intact, your stump could continue to grow. Do you really need to deal with the same tree over and over again? Go green! - We are all always looking for more ways to be Eco-friendly. Grinding your stump is a smart alternative to other methods that are less than Eco-concious. Time efficiency – One of the quickest and easiest ways to make your yard look like the stump was never there is to go the way of the grind. Little to no chance of damage to surrounding trees or plant life – Other methods require equipment that can destroy nearby trees and plant life. Focus on taking care of the problem at hand without compromising other living things that make your yard look so pretty. Of course the other decision you have to make when it comes to stump grinding is who you will call on to get the job done. At C.S. Flournoy we have spent well over 30 years taking care of the local Richmond residents and their tree care service needs. We know what it takes to get the job done, including stump grinding. 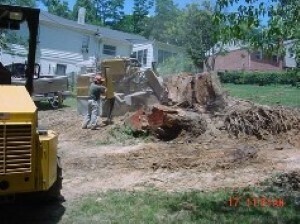 If you are looking for Yard tips and Tree Removal Articles from a Richmond Tree Removal Company then please call 804-264-1000 or complete our online request form.